CD, old camera part, spiral wire bind, acrylic paint, asst. buttons and doo dads a.k.a. thing a ma jiggies. I hope you all have a wonderful and safe Independence Day. thank-you for your visits and kind words. I initially prepped and textured the canvas with black gesso. to think how I might embellish her hair and her neckline. Now I had done it, gone too far, and hated it. permanent marks remained. What was I to do next? ferociously sanding away at the entire canvas. of a young Liz Taylor. As always, I thank you sincerely for your kind words and visits! My completed polymer clay mosaic, ready to hang. My previous post shows the pieces I had created for completing this project. It took me a bit longer than I had hoped, but more importantly I enjoyed the process. It was an escape, a detour if you will, from my usual creative path. There is a kind of mindfulness that takes place when trying to decide what pieces will go where. It was a relaxing and meditative process until... you find that you have an area that needs a tile which has yet to be created. I need to stockpile tiles. Incorporated in the final piece are commercial glass/stone tiles and beads. This was my first mosaic. Perhaps we all need to find an escape, a diversion from our normal routine, a change of pace. Thank you for your kind words and visits. 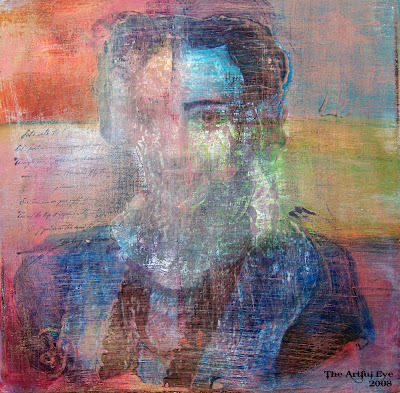 Do stop by "The Way I See It" my other blogspot. Work in progress here... thought you might be interested in seeing this one unfold. I have worked with polymer clay intermittently over the years and had forgotten all the great wonderful things you can do with this medium. This past Sunday, I was instantly re-inspired. I had the opportunity to spend 8 glorious hours with Laurie Mika, an extremely talented polymer clay mosaic artist. 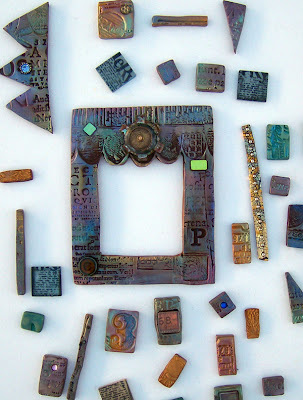 If you are interested in polymer/ mixed media and you ever get a chance to take one of Laurie's classes, do it. Check out her current events/ workshops and book. Here are some images of the clay tiles I created. 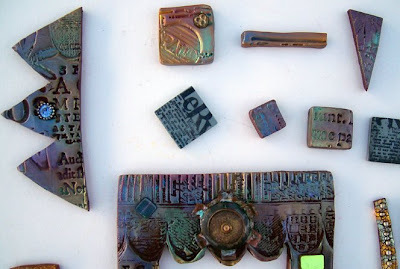 I stamped into the polymer clay using rubber stamps, found objects etc. applied gold leaf paper, pearl ex powders, acrylic paint, small bits and pieces of ephemera, jewelry parts, buttons, beads...you get the idea. You can click on the following images for a closer look. other glass and ceramic tiles to create a one-of-a-kind mosaic. 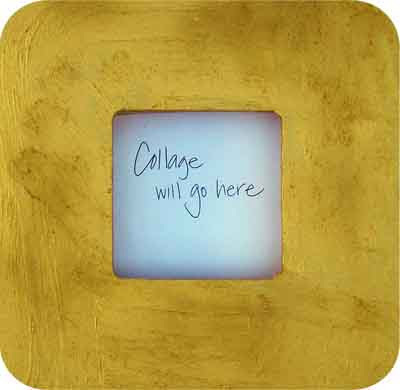 I will also create a collage for the center. Stay tuned... with any luck and time on my side. I'll have this done tomorrow. I'm grateful for your kind words. My other blog locale is here: "The Way I See It"